something just because it’s Theory but because we love it. In my opinion, their clothing drapes very well and it’s easy to fall in love with the polished look. I fell in love with a silk white blouse with black piping but it was a hefty $189 so that was an easy decision despite how flattering it was. Before we left for the day, she found that she was still thinking about the navy rain/trench coat so we went back to show her brother for a second opinion. They let us combine both of our items together to get the 15% off discount in the coupon book. My dress was $210 but with the discount it came down to $178 and change (the original retail price was $300). I know it’s still pricey but I wear all of my Theory pieces for years and they are classic pieces that have stood the test of time. As much as I love Theory I could never in good conscience pay full price for it especially after discovering the outlet location. I used to live closer to the outlets and my love for Theory was very bad for my wallet. I was definitely out of control during one of my previous visits. Now I only go to the outlets a few times a year. That dress looks bananas on you! LOL 😀 Pinning immediately! great dress! i haven't been to the outlets in so long! you make me want to go! Aww.. Thanks Yvonne! 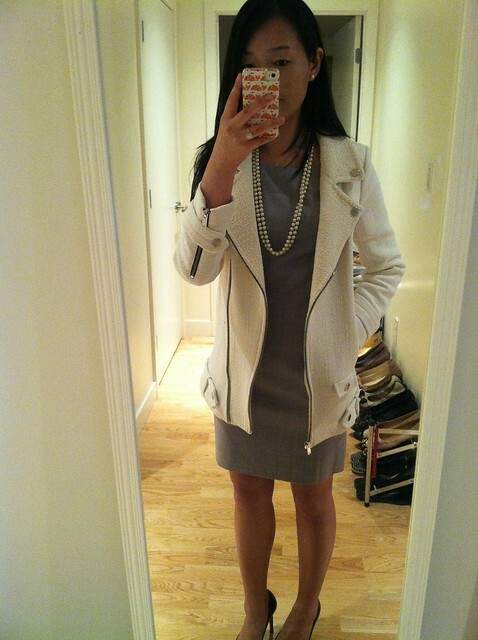 You should totally get it… I'm sure you've seen it on Anh (9to5chic) and it looks amazing on her. Thanks Brittney. 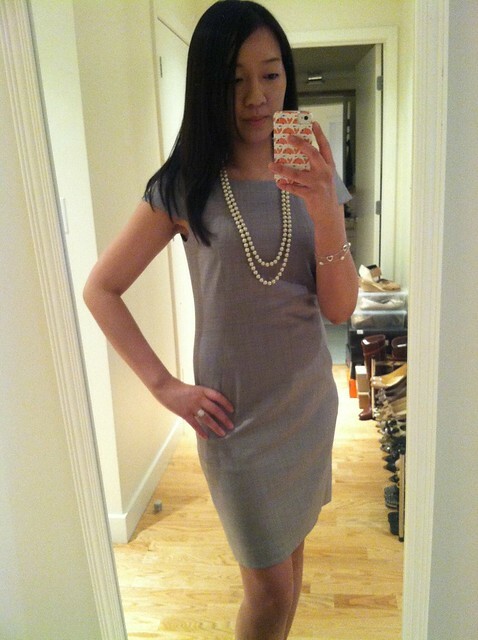 I save it for special events but in the spring and summer I love to wear dresses to work so it will be in rotation. I like that it's not too tight unlike their other sheath dresses.I tried taking photos with my DSLR in a few of my previous posts but of course I got lazy and posted these iPhone pictures instead because it's quicker. I spend too much time taking a lot of photos on my DSLR only to have a few okay/good ones and then spending time cropping them when I could just snap a few iPhone pictures. If I have time when I get home tonight I'll play around with the camera but to be honest I have a lot of errands to do and time (I don't have) always seems to fly by when I mess with the DSLR. Thanks Annie! I appreciate the pin. 🙂 I think you should get the dress too! I believe it came in 00. Thanks Miriam!The other time I went was last year in October. Outlets are trouble for me especially if they have a Theory. Ah I see. That's completely understandable, and don't feel pressured by my comment or anything–I was wondering if something had happened to the camera haha! Thanks so much, Yi-chia. :)Yup! I hated outlet shopping until I discovered Theory there. 😀 It's usually 50% off retail and during holidays it's an additional 20-25% off of that otherwise you can use the 15% off in the coupon book. Thanks Sheila! It's definitely going to be one of my favorite dresses.